Francistown -- Botswana is the front line of the war against AIDS. This insidious disease has spread silently, but all too swiftly through the population of this southern African nation, that sits on top of South Africa. UNAIDS estimates that fully one-third of Botswana’s sexually-active population between the ages of 15 and 49 (out of a total population of 1.5 million) are infected with the virus that causes AIDS, the highest rate in the world. About 85 persons are infected with HIV every day and one of every eight infants are infected at birth.
" We are all infected with this virus because we all live in a country that is infected. And until we win the war against AIDS no one can say ‘I am not infected’. " The disease has affected every segment of society, sparing no one. It spread rapidly after being detected because many people did not understand how it was spread, or how to prevent it. Although recent UNFPA surveys show that nearly 80 per cent of people in the 15-49 age group have some knowledge of how AIDS is contracted, they are not altering their sexual behaviour. The problem now is how to transform knowledge into action. Failure to change behaviour is aggravated by the conspiracy of silence that has surrounded AIDS. Because infection carries a tremendous societal stigma, many people who are HIV positive do not go in for testing or counselling, and the course of the disease continues to take its toll. Despite the very high infection rate, the faces of AIDS are not easy to find. In a dark, nearly window-less concrete block house on the outskirts of Gaborone, a woman props herself up on one bony elbow and stares blankly at the camera. Her name is Dipuo and she is just 23 years old, with two small children, 2 and 6 years old. The disease has entered its final stages and she has only a few weeks to live. As her children play at her bedside, Dipuo talks quietly with Mpule and a small group of journalists. “ I was diagnosed HIV positive in July 2000, after a series of illnesses,” she explains in a voice barely audible. “My boyfriend ran away when he found out I was infected. I have no idea where he is.” She doesn’t know if her two children have the virus or not, they haven’t yet been tested. But her grandmother will take care of them when she is gone. “I have been lucky in one way,’ she explains, “the village has not ostracized me.” This village, known as Gabane, is being mobilized to get the message out about AIDS, as well as to treat victims with dignity and compassion. 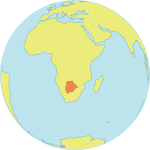 In 1999, with private investment, Mpule set up an independent foundation dedicated to combating the AIDS pandemic in Botswana. Dipuo is one beneficiary of Mpule’s efforts. Her foundation has supported the Gabane Home-Based Care Project which provides victims living in this small community with food, basic medical care, and above all with companionship and compassion. It is a model that is being replicated in other parts of the country. The social and economic costs of ignoring the pandemic have been debilitating for the country. The average life expectancy in Botswana has fallen from 67 years to 47 as a result of AIDS. Within 15 years the economy, though continuing to grow thanks to its main export, diamonds, is projected to be one-third smaller than it would have been without the impact of AIDS on the work force. Francistown, known as the AIDS capital of the world, is the country’s second largest city, situated 400 kms north east of Gaborone. Here the ravages of the disease are seen in the frightened look of residents, the proliferation of fresh graves in the cemeteries and the number AIDS victims occupying hospital beds as they wait to die. Francistown, like the rest of the country, simply didn’t recognize the threat for what it was. But they are taking action now. “We are grateful to the international aid that we have received, especially from UNFPA, in our efforts to fight this war,” says Mrs. Msojane. Back in the capital, Helen Mhone is another outspoken advocate of the need to take action to fight AIDS. She has a compelling reason for doing so – Helen is one of only 12 people in the entire country who have “gone public” with their HIV positive status. In an effort to help other women, like herself, get through the agony of infection, she founded an NGO called the Coping Centre for People Living with AIDS (COCEPWA). All members are women and all are HIV positive. Founded in 1999, it now has 45 members and 50 volunteers. The women meet every week for therapeutic workshops where they share worries, concerns and experiences. The atmosphere is positive and the talk constructive. Thanks in part to a generous grant from the Bill and Melinda Gates Foundation in Seattle, Botswana is beginning to launch a major nation-wide anti-AIDS campaign. At its core are a number of inter-linked prevention strategies involving young people and local communities. Known as the African Youth Alliance, the project will run for five years and also involves Ghana, Tanzania and Uganda.